Slowly watching one's senses fail is a sense of horror unlike any other. Now, visually, this can be somewhat curtailed thanks to the new bionic-eye invention, the Argus II. Recently implanted with resounding success on blind American Roger Pontz, the Argus II is not perfect, but enables tremendous new capabilities in the visualization of light and dark differentiation. This enables Pontz to identify people, different locations, and sudden changes in environment far more accurately than he had before. As a teenager, Pontz had begun manifesting symptoms of retinitis pigmentosa, where the eye's retinas fail to transmit light patterns to the brain, and at age 40 he was fully blind. Then, a virtual miracle occurred in the form of the Argus II technology. 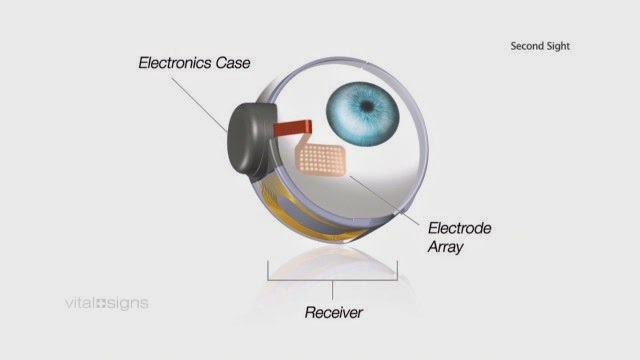 The Argus II system consists of a video camera mounted in a pair of glasses, which beams images to an small artificial retina implanted at the back of the eye. That retina then communicates the signals with the brain via cell-stimulating electrical pulses. Although Pontz, the second American to undergo the Argus II implantation, had to relearn how to process visual signals using the new device, he lauded the results. Pontz told CNN, "It's been pretty awesome," he says. "I can tell when my grandson runs around the house, I can tell when people step in front of me, I can tell when my wife had on a white top versus dark bottoms, vice versa. I could follow my mom around on Easter; she had a light top on. Every day it's something small but something different." Eyes on the prize: the Argus II's optical elements.